Anthony and the team have worked with local councilors, the team from the Adventure playground, the library and other community groups and schools to win fudning to improve the park. This has been going on behind the scenes for over a year ever since the first ‘what if’s’ we created for the consultation in the park. The gym is free to use. For anyone. Today I saw young children on it, adults and the older generation. Everyone looked happy. I felt a little bit bad as I had to ask the children to vacate the machinery as you aren’t allowed, without consent to photograph them. 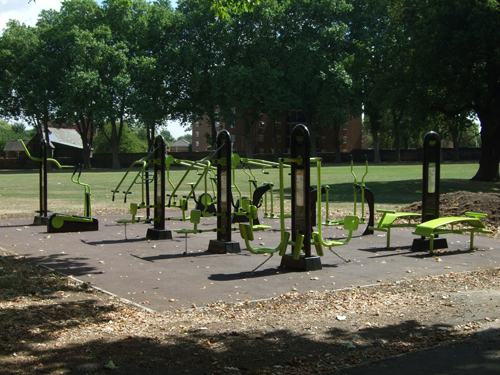 The gym was very well used when I was in the park, despite the act that the library was closed today. Everyone we spoke to said they would like a cafe in the park near the library. Everyone we spoke to said they didn’t want the library to close. Entry filed under: Park Improvements. 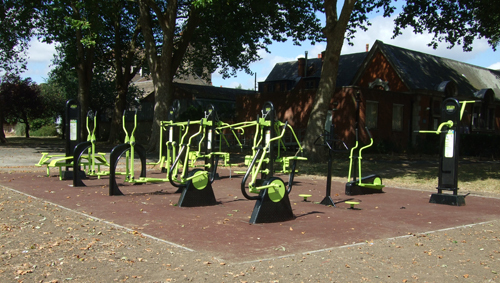 Tags: bellingham, designed by good people, friends of home park, HOME PARK, OUTDOOR GYM, SYDENHAM.